Something magical happens when you roast meats or vegetables. All the flavors intensify as the sugars caramelize and instead of getting dry and tough, everything becomes more delicious. And as a technique, it’s hard to find one with lower maintenance: just preheat, season, and roast. Using the same technique for both main course and side is also another great way to simplify your dinner preparation while maximizing flavor. Over the last few months, the smell of dinner roasting in the oven has kept me smiling while delivering math problem explanations over Baby Sophie’s witching hour wailing. Last night, I roasted a pork tenderloin and a side of spaghetti squash at the same time. Everything cooked for a little over an hour at 350 degrees Fahrenheit and emerged tender and juicy. I used a fork to test the doneness of the squash and a thermometer for the pork to see when it reached 145 degrees. Few people realize that the USDA has revised the temperature guidelines for pork down to 145 degrees Fahrenheit, followed by a three minute rest time. It’s amazing what a difference that 15 degrees makes. The pork was like no pork I’d ever eaten before; more tender than a filet mignon at a fancy steak house. Once the roasting was done, I whipped up a quick pan sauce for both dishes. For the pork, I added some chopped shallots, mushrooms, and cider to the pan juices. Once everything had time to reduce and caramelize, I finished the sauce with a little heavy cream, but I could have skipped it to make my dish more guilt free. I’m glad I didn’t though as the sauce was lick the plate clean delicious. The squash would have been good on its own as well, but got taken to a whole new level with some caramelized walnuts and bacon. Each sweet strand was the perfect backdrop for my super tender pork. Spaghetti squash is a vegetable I should make more often. It’s so easy to get into a rut, serving the same vegetables over and over again, but trying a different side can turn an ordinary dinner into a real feast. Dressed up sides are becoming more and more celebrated in all the cooking magazines I’ve been seeing and seem like they are going to be the star of many holiday tables. 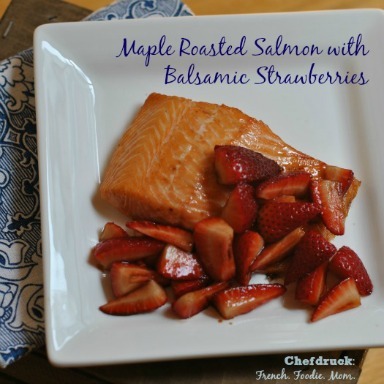 Roasting brings out wonderful flavors in pork while keeping it melt in your mouth tender. In a large roasting pan that is flame-proof (ie: not a Pyrex glass dish), place the pork loin. Rub it with vegetable oil and dust it thoroughly with the spice mix. Cook at 350 degrees until a thermometer reaches an internal temperature of 145 degrees Fahrenheit, about 65 - 75 minutes for a 2.25 pound roast. Remove the roast from the pan and let it rest for 10 minutes before slicing and serving. Meanwhile, make the sauce. Add the shallots to the pan and cook for 3 minutes until softened. Add the cider and the mushrooms for another 5 minutes, scraping the browned bits up and adding it to the sauce. Finish with the heavy cream and bring to a simmer for another 1-2 minutes. Serve immediately. Cut the squash into 4 pieces. Remove all the seeds and filaments from the middle and discard. Place the squash in an oven-safe dish and roast for 60 minutes until a fork pierces the flesh easily. Let the squash cool a little. Now run a fork through the flesh to pull out spaghetti like strands and place in a bowl. Heat a large skillet over medium heat. Cook the bacon pieces until crisp. Remove the bacon and reserve in a separate bowl. Add the butter to the pan along with the brown sugar. Melt and combine. Now add the walnuts and bacon and cook for another 1-2 minutes until coated and toasted. 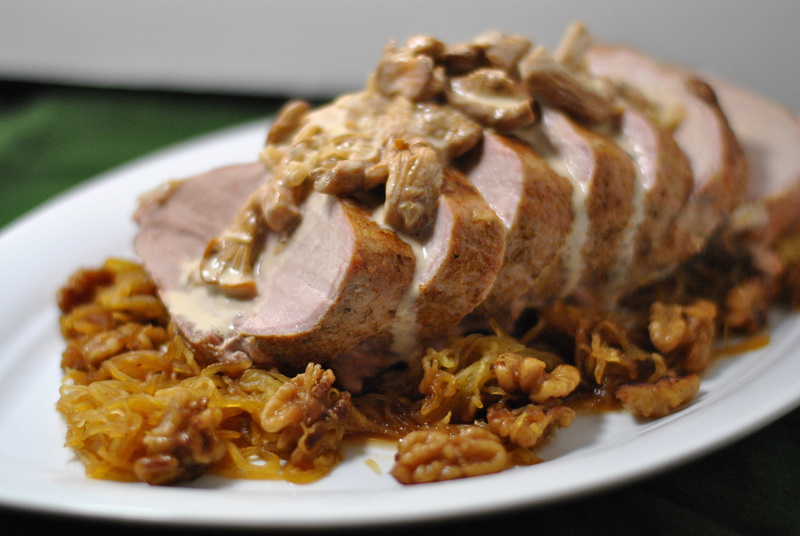 Toss the bacon and walnuts with the squash and serve immediately either alongside or as a bed for the pork loin. 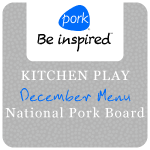 This post is part of the Kitchen Play December Holiday progressive menu campaign and is sponsored by the National Pork Board. The National Pork Board is also sponsoring a fun giveaway at Kitchen PLAY. 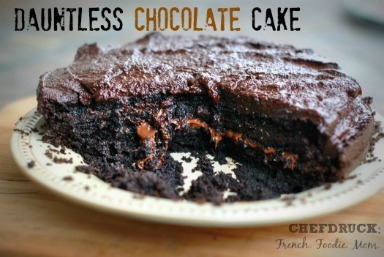 To enter, recreate these or any recipe from this month’s Progressive Party, post about the experience on your blog and provide a link to your post on Kitchen PLAY. All qualifying bloggers in each course will be entered to win a National Pork Board prize valued at $100 (6 prizes total). The deadline is December 31, 2011 and these are the full contest rules. Good luck! Pork, a gorgeous mushroom cream sauce and spaghetti squash. Yep, that sounds like a meal made in heaven. I’m glad to be in this round of Kitchen Play with you. It was a fun one! Today, often hate fish because of the flash flood happen in my place. 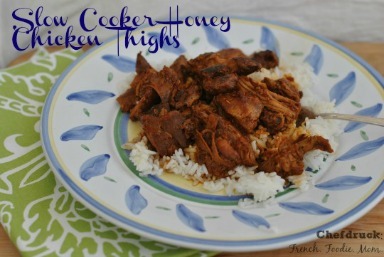 Often look on pork and chicken for meals.